After extensive collaboration with the membrane manufacturer to develop a high rejection 150GPD membrane, it is finally here. Before, you'd have to sacrifice purity when you want larger capacity, but now you would get larger capacity and higher purity than Dow Filmtec and GE 75GPD membranes. Using our new 150GPD high rejection membranes, we bring you high volume and high purity RO+DI systems. Our 150GPD membranes have achieved 97-98% rejection rate in real-life conditions, not just published values you usually see. This system is a 6-stage 150 gallon per day reverse osmosis + 2DI filter system with single outputs (mainly for Aquarium and Reef). We use 2 Nuclear-grade color changing DI filter with refillable Clear housing and DI dispensing ball Valve for applications like Reef, Aquarium, hydroponics, humidifier, jewelry cleaning, any application requiring ultra pure water. * Note: 150 gallons per day capacity is the maximum production rate of the system, actual production rate depends on input pressure and temperature. For example, at 70psi and 60 degrees the system makes 120 gallons per day or about 5 gallons per hour. Lower input pressure and temperature would decrease production rate. We offer high capacity filters, you only need to replace the pre-filters and post filter once a year instead of every 6 months, the cost is only $25 for 3 filters part no. FK-3 which you replaced once a year. The DI filter replacement period depends on the water quality of your tap water and how much DI water you are using. On average it is able to process 500 gallons of RO water. 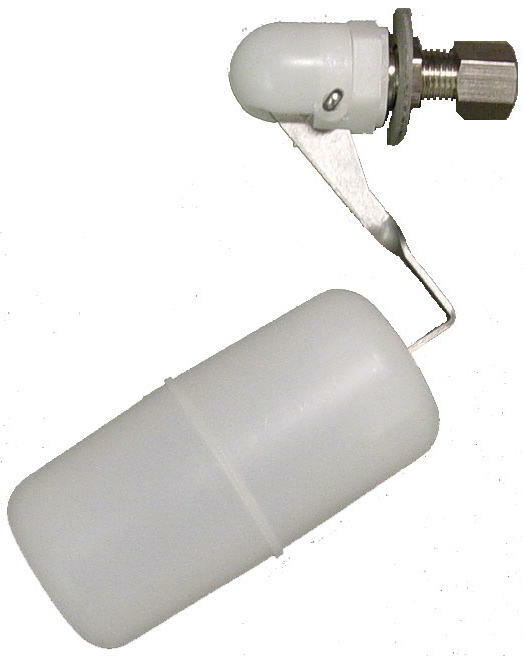 Since we use refillable DI housing, you can purchase the DI resin to refill the filter. It costs less than buying filters time after time. 5th stage: DI filter (de-ionized, de-mineralize filter), Nuclear grade, color changing DI filter with refillable clear housing. The DI filter removes remaining of dissolved solids after RO system. 6th stage: DI filter (de-ionized, de-mineralize filter), Nuclear grade, color changing DI filter with refillable clear housing. The DI filter removes remaining of dissolved solids after RO system. 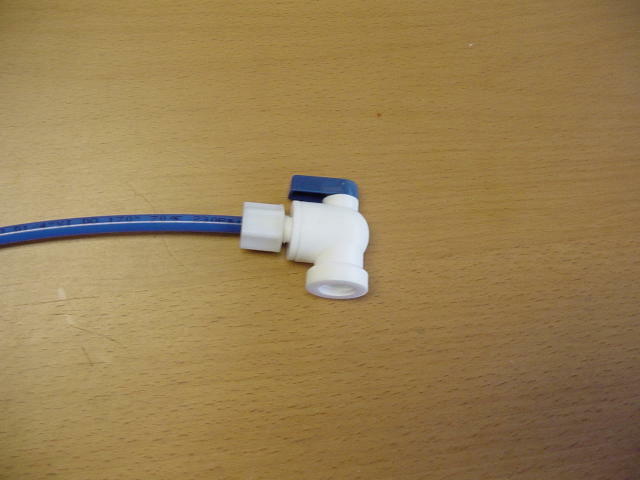 A ball valve is included for dispensing DI water into open containers or to open tank. GOOD for reef, aquarium, hydroponics applications. * The advantages with using clear, refillable DI filter: REFILLABLE means that you can partially refill your DI filter and eliminate the effect of channeling, and increase the usable life of the DI resin 3 times and filters out 3 times more water. All DI filters inline type or cartridge type suffers from channeling effect. DI resin would shrink in size when they are been used. Then some water will pass through the resin without been filtered. Also water will find the easiest way to go through the filter, and that is the channeling effect. NOW we have a solution to solve this problem by using the clear-refillable DI filter. You can now get constant performance of DI filter, and refill just partially to keep the resin compact inside the housing. Also you are able to re-use the DI resin by re-mixing it. Thus eliminate the channeling effect. Therefore you are able to achieve optimum performance, save 30% of the resin, increase the usable life of the resin, and filter out 3 times more water. All these will translate to more saving of money. The best of all, you can see all this in action in our clear housing. 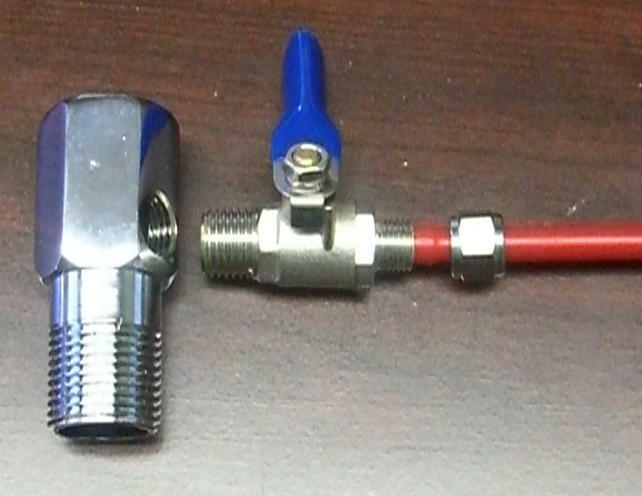 Designing consideration for inline DI filter. 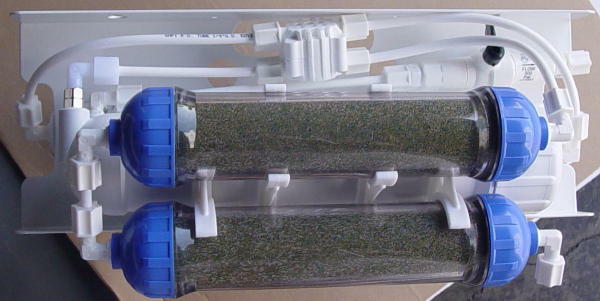 The ideal shape for the inline DI filter is long and thin like our 2" x 10" clear housing. What's important is to increase the contact time and minimize channeling, and maximize the usage of resin. Larger diameter inline filter like 2.5" wastes more resin and has more channeling problem. Resin that is near the outer diameter are not been used much, and there are more places that will form channeling effects. So the IDEAL and efficient design will be to use two smaller diameter inline filter in series, to achieve contact distance of 20 inches. 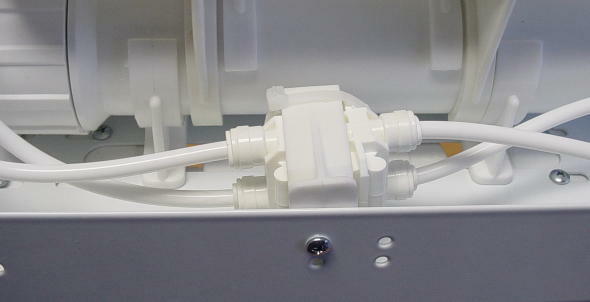 We are first company to ever come up with the idea on all clear housing Aquarium RO system. We started the trend!